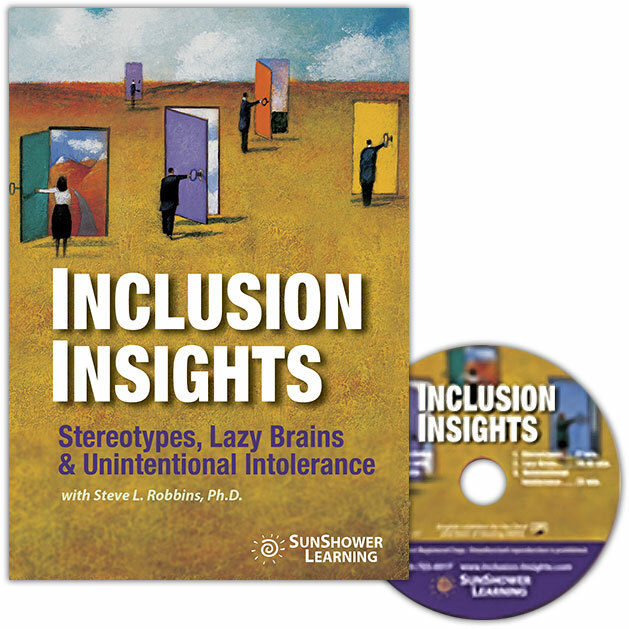 Inclusion Insights features Steve Robbins, the innovative speaker / socio-scientist storyteller who coined the phrase Unintentional Intolerance. 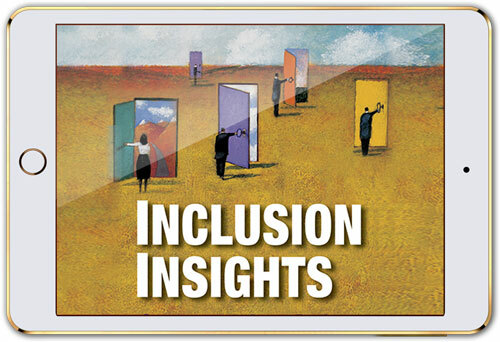 Inclusion Insights is a powerful presentation of Steve’s latest thinking – why inclusion is important, why it’s about creativity and innovation, and not just doing the right thing. 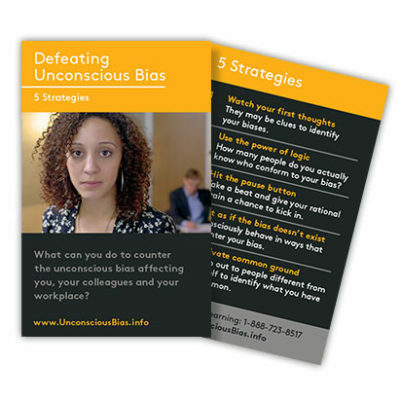 Full training kit designed for flexible use for one extended workshop, 3 shorter workshops, or 11 insight segments to be used as discussion starters. 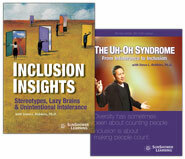 SPECIAL INCLUSION INSIGHTS BUNDLE PRICING! 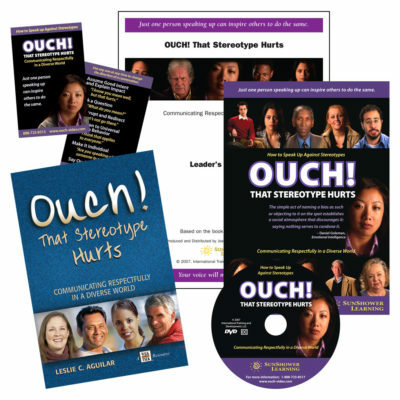 Buy the Bundle and save 15% = $1100.00 on one bundle! 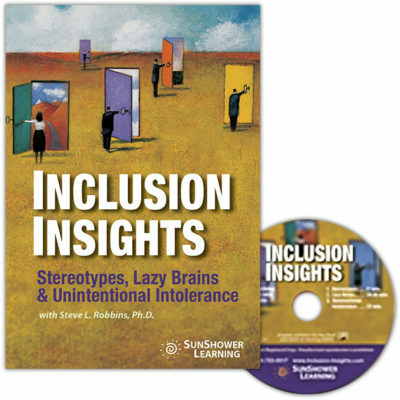 Contact us at 407-859-1191 or email us HERE to purchase an Inclusion Insights streaming license. For other quantities, please call 407-859-1191 or email us HERE. 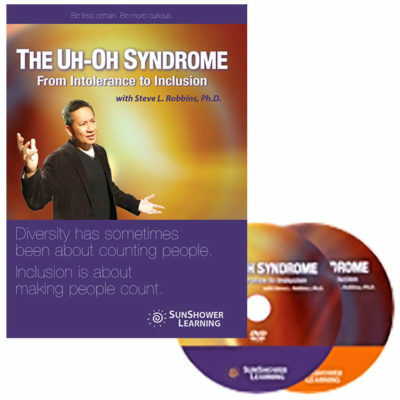 One day last month, a friend and colleague asked me to take a look at a new diversity/inclusion video from SunShower Learning. “It’s called Inclusion Insights, he said, and I think it’s something special.” Wanting to do my friend a favor and knowing that SunShower has a reputation for producing quality diversity / inclusion products (most notably, Leslie Aguilar’s video Ouch! ), I said yes and sat down one morning – coffee cup in hand – ready to view what I knew would be a solid product. Well, my friend had double-crossed me. He failed to tell me that once I started watching, I wouldn’t be able to stop. Simple in format – speaker and diversity-expert Steven Robbins speaking in front of a live audience – the video carries you along on its humor, cleverly presented insights, and carefully chosen metaphors. The end result is a product that imparts its message of inclusion in a way that any audience can hear, understand, and, most important, not resist. 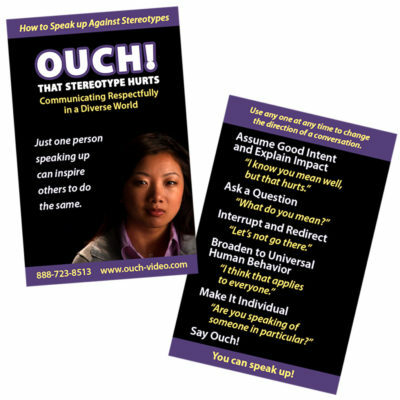 Simple in format – speaker and diversity-expert Steven Robbins speaking in front of a live audience – the video carries you along on its humor, cleverly presented insights, and carefully chosen metaphors. The end result is a product that imparts its message of inclusion in a way that any audience can hear, understand, and, most important, not resist. Additional Quantity Discount Pricing: For deeper discounts on the purchase of 10+ video copies, 2501+ trainee licenses, 10+ 2-Video Bundles or for pricing for your learning initiative please call 407-859-1191 or email us.